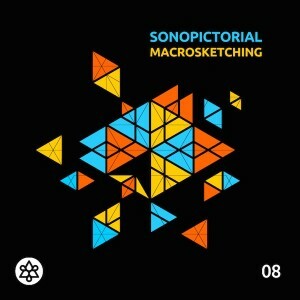 Macrosketching is the debut album from Мах Sonopictorial, a Latvian producer now based in Berlin. After several years of releasing minimal, tech house, and nu-disco under different monikers on labels like De’fchild, Globox, and Spanda Records, his own platform, Max finally found his true love: dance floor-oriented psychedelic music. This album represents an attempt at applying skills previously accumulated from producing non-psychedelic styles of dance music in a more progressive and melodic direction hopefully even accessible by people unfamiliar with psychedelic trance music. Mastered by Koan Mastering Lab with artwork by Max Sonopictorial. MP3 Download | FLAC Download | WAV Download · Download count: 12,078. Really unique…glitchy squelches and electro-bumps over a thumping beat. Each track gets better than the previous one until my head was totally bobbing here at the office. Headphones a must to get the full 3D effect. Delightfully askew – fluid self-molding plastic, crisp spiky metal points and bouncy, pounding and provocative grooves. All wrapped up in a clear picture of sound. Well done! Pretty fine progressive trance. Warm, comfortable and «cityscape» sound in first two tracks and free and elemental as the cool spring wind in the least ones. BOOM! great work! i`m fascinated, but i never heard from “sonopictorial” before. keep on holding the good work! Feel´s like I´m a rubberball bouncing around on a mission. :) Great realese! OMG! Just stumbled upon this page and the second listening in was like a train comin’ over me… After listening to 50 bad examples of 2015 trance on youtube, I had the pleasure to listen to this one! Respect! Excellent release ! Sharp sound cutting as a blade and bouncy rhythms. Scheduled for mass sharing. This is Truely a remarkable work of art !! Intense, Intelligent and Groovy !! This went straight to my collection along side some of the well known Uplifting tracks! This album is dope. Super funky. I just love this album to death :-)! Always get’s my energy flowing, so thank you so much for creating & sharing this Sonopictorial! Great album! Slips quite nicely between Psy-Trance, Progressive and techno! Certainly hundreds hours to built such music. Bravo!!! For sure this guy has become one of my main references. Real fine and modern progressive.